Religious colleges and universities in the United States are growing at a breakneck pace. By the tens and hundreds of thousands, some of America’s brightest and most dedicated teenagers are choosing a different kind of college education, one that promises all the rigor of traditional liberal arts schools but also includes religious instruction from the Good Book and a mandate from above. In this eye-opening report, Naomi Schaefer Riley investigates these schools, interviewing administrators, professors, and students to produce the first comprehensive account of this important trend. With a critical but sympathetic eye, she takes the reader inside the halls of more than a dozen schools that are training grounds for the new missionary generation―Catholic, Protestant, Jewish, Mormon, and even Buddhist. What distinguishes these colleges from their secular counterparts? What do its students think about political activism, feminism, academic freedom, dating, race relations, homosexuality, and religious tolerance? 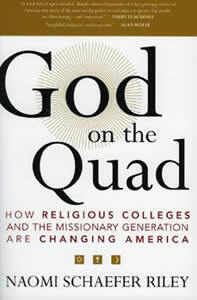 The surprising answers in God on the Quad are a key to understanding the forces at work in post-9/11 America. An insightful, balanced, and respectful guide to this world, one that its own members will find provocative and from which strangers to it will learn a great deal. A joy to read, this book is also an arresting picture of a new generation that is poised to change the face of our culture and public life. Lucid and meticulously researched…. Anyone who still believes that religious colleges must abandon or dilute their religious mission in order to make a real contribution to American society will discover that something closer to the opposite is true. Riley presents an engrossing survey…this book is a fascinating anthropological glimpse into unfamiliar pockets of religious America. Balanced treatment of a socially potent movement in higher education. 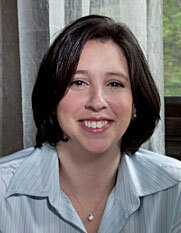 Naomi Schaefer Riley spent a year touring the parallel universe of religious colleges…. The results are illuminating–and important. It is no small feat to provide the in-depth, interesting, and absolutely objective overview that Naomi Schaefer Riley does. An important and refreshing new look. Her writing is as light as conversation, but her thinking goes as deep as the dispute in American education today. Inspiring! A sympathetic, moving, insightful, thoroughly and clearly reported account. Insightful and challenging…. Riley is a wonderful chronicler of a little-known academic world where faith and reason still intersect. There’s hope for higher ed. Why Blue America need not be appalled by religious colleges.